One of the major complications of applying a prosthetic device to facilitate gastric partitioning has been intra-luminal erosion of the prosthesis. Removing an eroded gastric band is fraught with difficulty secondary to the extensive inflammatory response around the proximal stomach and left lobe of the liver. As a result, bariatric clinicians have attempted to apply endoscopic technology to facilitate removal of eroded gastric prostheses. Our study reports on our experience of applying endoscopic scissor transection to remove eroded gastric prostheses in a large tertiary care medical center. A Retrospective chart review was conducted to identify all adult(>18) patients managed endoscopically for removal of eroded prosthesis post-bariatric surgery at the Baylor College of Medicine Comprehensive Bariatric Surgery Center and the University of Texas-Houston Bariatric Surgery Program. Seven patients, mean BMI 40.5+/-7.2, were managed endoscopically to remove eroded gastric prosthesis post vertical banded gastroplasty. All patients (7/7) reported symptoms consistent with a proximal gastric outlet obstruction and inadequate weight loss was reported by 71% (5/7). The mean time for endoscopic band removal was 26.8+/-4.8 minutes. All eroded bands were evident at the end of the gastric pouch and were visualized with either a normal or retroflexed endoscopic view. All 7 patients were discharged the same day of their procedure. Mean follow up of the patients was 9.7 weeks(1 week-30 weeks). Three patients underwent revisional bariatric surgery following the band removal. 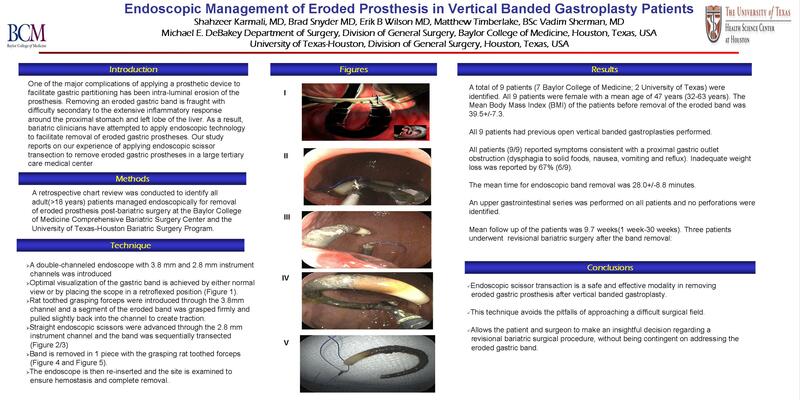 Our study demonstrates that endoscopic scissor transaction is a safe and effective modality in removing eroded gastric prostheses after vertical banded gastroplasty. Furthermore, this technique avoids the pitfalls associated with removing the eroded bands surgically. It also allows the patient and surgeon to make an insightful decision regarding a revisional bariatric surgical procedure, without being contingent on addressing the eroded gastric band.